The Development of a Comprehensive Legal Framework for the Promotion of Offshore Wind Power discusses the impact of technological, economic, spatial, and market issues on the legal framework for the promotion of offshore wind power. There is an urgent need worldwide to increase the share of renewable energy in the overall energy supply as rapidly as possible. With a well-developed and proven feasible technology, offshore wind power has come to the fore as the most promising means of achieving this goal. However, fragmented authorities and procedures pose tremendous challenges to the development of an integrated legal framework for offshore wind power and the complex installation and grid interconnections it requires. This book analyzes the features essential for the development of such a framework, drawing on the experience of ten countries that have such schemes in place – France, Germany, the United Kingdom, Italy, Norway, the United States, Australia, China, Korea, and Taiwan. The contributors show that a carefully planned mix of incentives and supplementary schemes is indispensable. 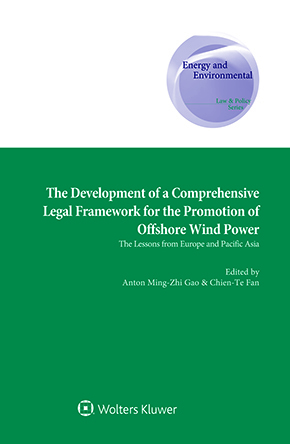 The chapters are drawn from the presentations and papers offered at the International Conference on Comprehensive Legal Framework for the Development of Offshore Wind Power Around the World held in Taiwan in August 2016. This book reveals the contours of a strong and sound legal framework surrounding offshore wind power that serves to enable and facilitate the efficient application of policy initiatives and subsidies. As an analysis of not only the incentive scheme but also regulatory regime of the legal framework, this book will prove indispensable to lawyers, policymakers, officials, and academics concerned with the management of sea space to include the wind power necessary to achieve and sustain renewable energy goals.